1. Use your grater to grate the carrots; I used the larger sized section of the grater. Mostly because the smaller holes take longer! 2. Using your paring knife, mince your onion (or have someone else do it for you :) ). 3. Spray the skillet with nonstick cooking spray and saute your carrots, onion, salt and pepper on medium-high heat for about 3-5 minutes, or until the onion is translucent. 4. While the vegetables are cooking, cut your teriyaki tofu into very small pieces, or crumble it with your hands. 5. Add the crumbled/cut up tofu, carrots and onions to your mixing bowl and combine. 6. Lay out 25 wrappers and fill your small bowl with the room temperature water. 7. 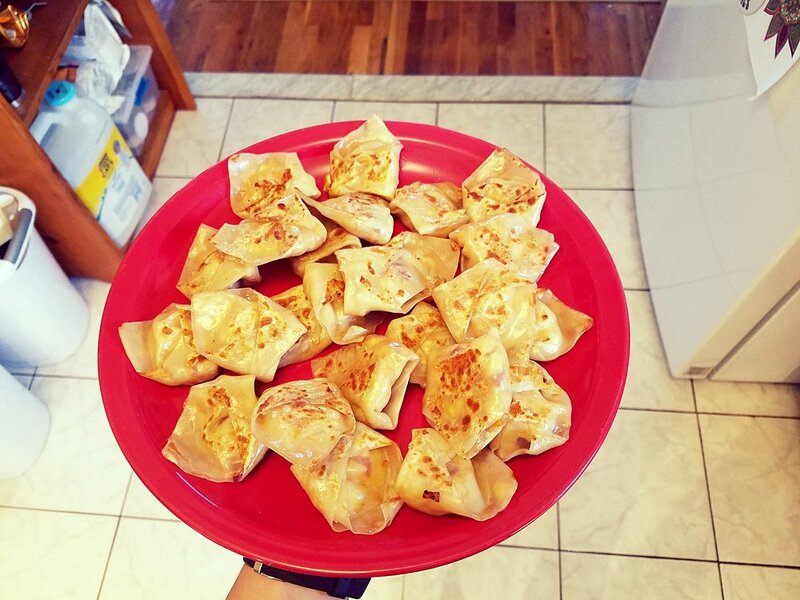 Scoop approximately 1-1.5 tablespoons of tofu mixture into the center of each wrapper. 8. When folding each wrapper, wet your fingers with the lukewarm water and run your finger along two adjacent sides of the wrapper. 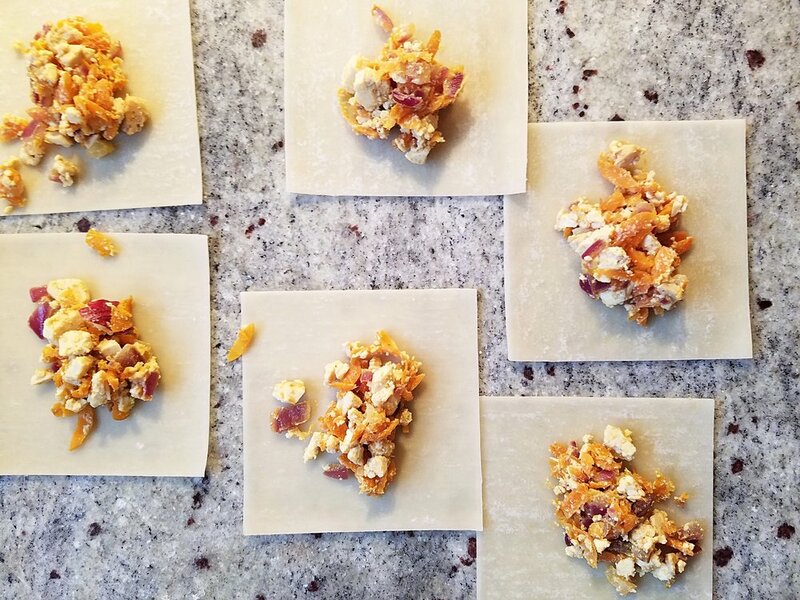 Fold the other two dry sides diagonally onto the wet ones, forming a triangle shape. 9. Take the two bottom corners (the two nearest to the folded edge) of your triangle and wrap one over the other. Pinch the corners together to secure. 10. Repeat with each wrapper until all 25 are folded and secure! 11. 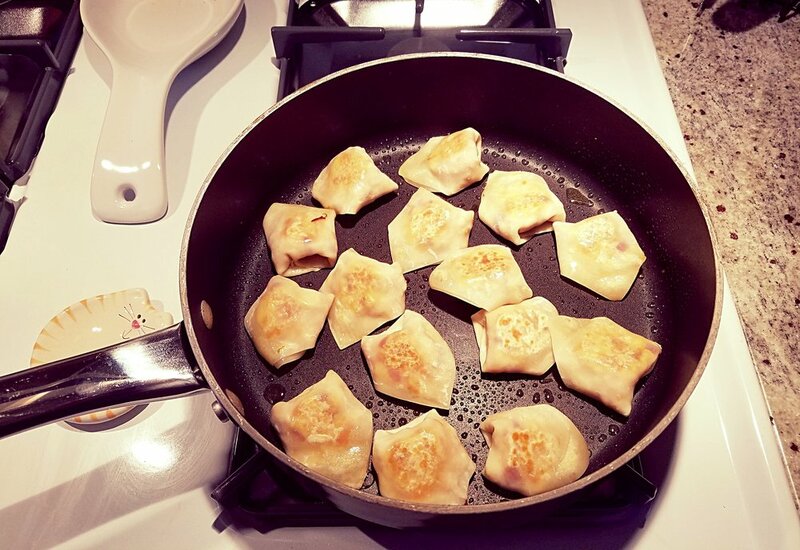 Spray your skillet with cooking spray and add half of the dumplings to the skillet. 12. Cook on medium heat for about one minute, then turn dumplings over. 13. Cook on medium heat for another minute, then add a splash of water to the skillet and cover for thirty seconds. 14. Remove from heat and repeat with the remaining dumplings. *If you can't find or don't have access to Nasoya teriyaki marinated tofu, you can use plain super-firm tofu and mix in 2 Tbsp of your favorite teriyaki sauce.